DuPont-Ball Library is celebrating 125 years as a federal depository library. Originally, Stetson University’s library was on the second floor of DeLand Hall. On April 5, Stetson University’s duPont-Ball Library will hold a reception from 3-5 p.m. on the main floor of the library to celebrate its 125 anniversary as a federal depository library. Everyone in the Stetson community is welcome to attend the celebration which will include refreshments, displays and a brief program including a presentation from the city of DeLand. DuPont- Ball Library is the oldest federal depository library in Florida opening in 1887. Guest speakers include Mary Alice Baish, assistant public printer and superintendent of documents for the Government Printing Office in Washington, D.C., and DeLand Mayor Bob Apgar. Both guest speakers will make brief remarks and a special presentation to the library. In addition to the speakers, there will be displays about the history of the federal depository library at Stetson, including unusual or historically significant government documents. Other federal depository libraries in Florida will be represented. The Federal Depository Library Program (FDLP) was established by the United States Congress to ensure the American public has access to government information. A federal depository library holds federal government documents and is able to make federal government publications available to the public without cost. Usually the publications are received through shipments of print and microfiche documents from the GPO. In recent years, ever-increasing numbers of these documents have been released in electronic and digital format. In 1909, the library collection moved to Carnegie Library Building now known as Sampson Hall. DuPont-Ball library is considered to be a “selective depository” which means it has chosen to receive only a subset of what the GPO offers. It holds about 23 percent of what is available to depository libraries. Most of the materials received by the library through the depository program are carefully selected to support the curricular and research needs of Stetson students and faculty. Currently, there are approximately 350,000 government documents in the library’s collection, and thousands more government publications available electronically through the library’s online catalog. The Stetson library started in 1887 as a small book collection of 1,200 to 1,300 volumes on the second floor of the east wing of DeLand Hall. In 1889, the library officially became known as Sampson Library in honor of C.T. Sampson who contributed to purchasing the books in the library. In 1892, the library’s collection moved to the first floor of Elizabeth Hall, and in 1909, the collection moved into the Carnegie Library Building now known as Sampson Hall. The Carnegie Library Building was funded by the Andrew Carnegie Foundation and the collection jumped from 4,000 to 15,000 volumes. 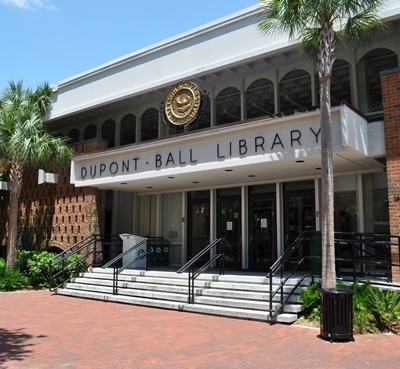 The duPont-Ball Library, named after a Stetson trustee Jessie Ball DuPont, opened in May 1964. For additional information, contact Barbara Costello, at bcostell@stetson.edu or 386-822-7185. You can read a comprehensive history of Stetson’s library online.